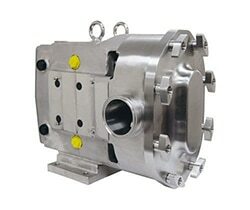 The SCPP circumferential piston pump range consists of two positive displacement pumps, specially desgined for transporting very low viscosity products at higher discharge pressures for food, dairy and beverage and other hygienic applications. The extensive range meets a wide spectrum of requirements under various working pressures. This Ampco ZP3 has a new front-loading seal design that eliminates all dead zones in the pump. Plus the stainless steel gearcase, bearing retainers, splash plate and cleanout plugs deliver maximum performance. The ZP3 technology and features make it the best value in sanitary positive displacement pumps today.